The new Bierini manor house has been built in 1870 and thus it belings to comparatively new manors of Riga. Throughout the time it has been reshaped beyond recognition and is in bad condition now. Owners of Bierini manor in 1870 built new manor house. This wooden building was located somewhat closer to the centre of Riga, at the junction of Marupite stream and smaller stream. This building was located at the road from the old manor house (Old Bierini manor, Lindenruh - located in Marupe region in site of present day school). From this new manor it was easier to manage the properties of bierini manor then owned by Behrens von Rautenfeld family. Part of the manor then was included in Riga. At the opposite bank of the road there was built an office building for manor (located in Kantora Street 11/13) - and thus the old road was named Kantora Street (Office Street). Owners of this manor were Heinrich Eberhard Behrens von Rautenfeld (1822-1895), Heinrich August Behrens von Rautenfeld (1850-1896) and his widow Teofila Anna Margarethe Behrens von Rautenfeld (approximately from 1898 to 1924). 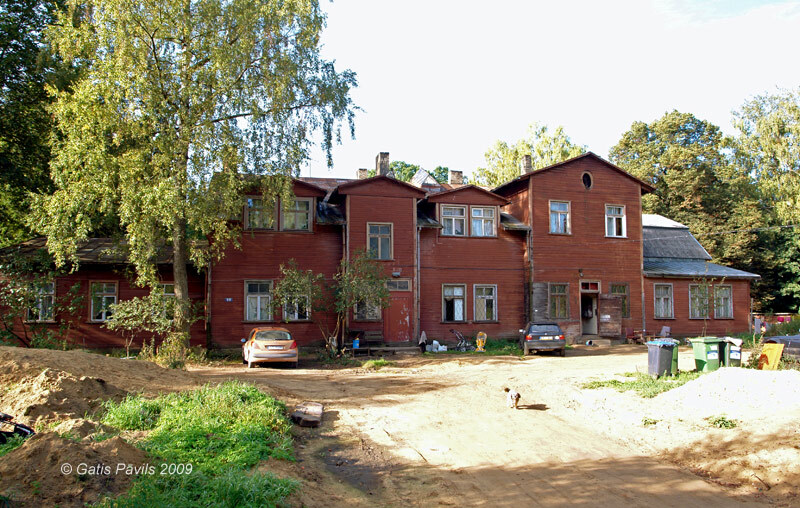 In 1924, as the land reform in Latvia continued, the new building of Bierini manor together with some 11 ha of land were allocated to the wife of the next Rautenfeld - Heinrich (1882 - 1929). Elizabete Emilija Behrens von Rautenfeld had two sons. She was a daughter of Latvian farmer, born Kugenieks. Heinrich married her in dramatic circumstances - she was chambermaid of Behrens von Rautenfeld family and such marriage happened against the will of other Rautenfelds. Elizabete transformed the manor house into tenement house with 14 apartments. She herself lived in one of these apartments. At that time the shape of the building did not change yet. In 1940the building was nationalised and there started chaotic rebuildings - the building lost its initial shape. Total number of apartments during the times of Soviet occupation did not change - even Rautenfelds continued to live there. Veranda was dismantled, brick chimneys built, house was planked with dark red-brown planks. Roof was covered with colored sheet metal and roofing slate. Nowadays, as the property rights from the times of first republic were renewed, the building with the surrounding land was returned to Rautenfelds. One fourth of this property has been sold to five co-owners already (2). Currently the building is in rather bad condition, untidy. There still is landscape park around the building, central element of the park - Marupite stream. Earlier there were other buildings as well - such as horse stable - cattle-shed with 2 living rooms (dismantled in 1938. ), apartment building for civil servants (close to manor house, later woodsheds built nearby). Kaupuža D. Rīgas muižiņas. Latvijas architektūra, Rīga, 2005, p.95. Latvijas piļu un muižu asociācijas mājaslapa, visited on 13th June 2009. Rīgas ielas, 1.sējums. Rīga, 2001, p.46. Rīgas ielas, enciklopēdija, 3.sējums, Rīga, 2009.g., p.309.